The home church of the Duke family, this congregation began at Gregson and West Main before moving to this impressive Duke-funded edifice in 1912. Towards the end of his life, William Blackwell was said to have approached the Dukes (Ben in particular) for financial support -- that's how bad he was at banking. Though I don't believe that Ben Duke is ever described as a ruthless businessman (that accolade surely belongs to his brother, Buck), he must have taken some satisfaction at watching the Methodist church erected on Blackwell's former property. The Dukes, of course, were Methodist while Blackwell was Baptist. Though utterly ruined, Blackwell still has the last laugh: ironically, the lasting iconic image of the city of Durham is the bull, Blackwell's company logo. Great stuff - thanks for adding it. I knew of the Holy War between the Dukes and Blackwell/Carr, but I did not know that Blackwell had asked BN Duke for support. That must have been a very bitter pill to swallow. W.T. Blackwell's financial ruin was recorded in the NY Times on December 30, 1894. He appropriately elaborated on his role in building Durham, and then advertised "...next Saturday the last of my property will be sold and divided...I want to invite one and all to attend this great sale...I am left without a dollar, no financial standing, and no friends to brag of, and those I have, if any, have no financial standing to aid me...everything I possess is up (for sale) and you can never expect any more help or aid from your old friend...I am at the end of my row, and can't go one way or another"
Where did he live in the years following his bankruptcy? Okay Gary...so the friends could have passed the hat and they all pitched in for a suitable eternal resting place. And, I might add, I believe it is in the same area of the cemetery as the Dukes and Staggs, so the "eternal neighborhood" is good. Begs the question...Who was the joke on? "Eternal neighborhood" = awesome. Seems like a good place to start an apocryphal story about how Blackwell's headstone was moved to make way for the Duke mausoleum. 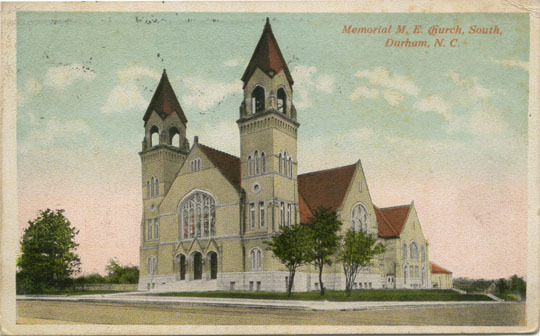 Duke Memorial Methodist began its existence as Main Street Methodist, located on the southeast corner of South Gregson Street and West Main Street. The Dukes, staunch Methodists, had been patrons of the church from its inception. When the growing church, with the support of the Dukes, sought to expand in the first decade of the 20th century, they looked to supplant the manse of the Duke's rival in the tobacco business, WT Blackwell, who had fallen on hard times. In 1869, W.T. Blackwell partnered with John Green and John Day in the partnership that sparked the creation of Blackwell's Durham Tobacco Company. When joined by Julian Carr in 1871 (whose houses, Waverly Manor and Somerset Villa, I've posted on before) they expanded rapidly, becoming a major tobacco empire. In 1874, they built their Italianate factory building, which still stands at the north end of the American Tobacco Complex. In 1875, W.T. 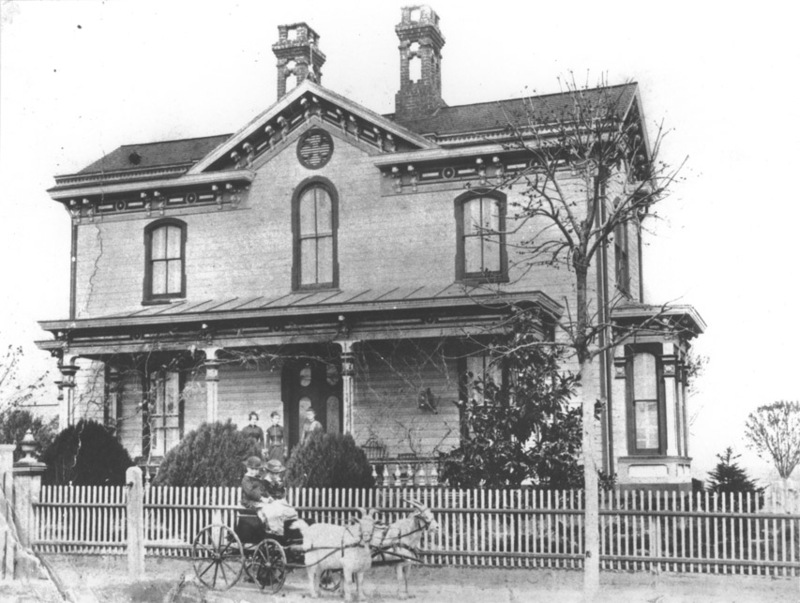 Blackwell built himself a house at the high point of the ridge to the northwest, along the western portion of Green St., which was later renamed Chapel Hill Street, at the northwest intersection with Lee St., later Duke St.
(WT Blackwell's house bears somewhat of a resemblance to J.S. Carr's Waverly Manor. I'm not sure if this was deliberate imitation or simply the popularity of the Italianate style). In 1907 they began work on their new church, which they called Memorial Methodist, a large steel-framed structure designed by an architect in New York. It was completed and occupied for its first service in 1912. 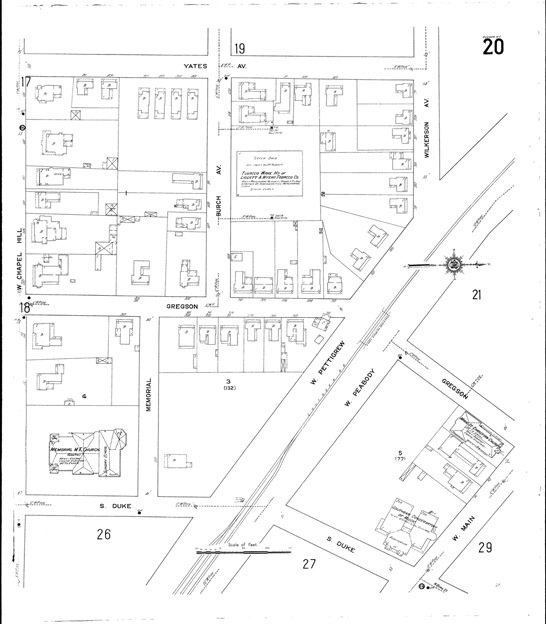 Sanborn map showing the church with the surrounding residential area. The Southern Conservatory of Music and the former church home at Main St. Methodist are shown on the lower right. The church changed its name in 1925 to Duke Memorial Methodist, in honor of its primary benefactor, Washington Duke. - creating the current church campus that extends from Duke St. to Gregson St.